Herbagen Anti Wrinkle cream is a super-greasy cream with effect in fighting wrinkles and protecting the epidermis against external factors: frost, wind, radiations. 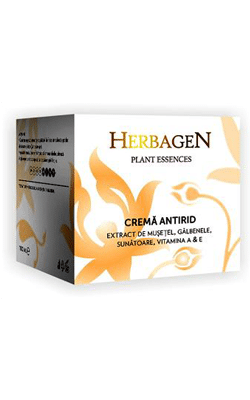 Herbagen Anti Wrinkle cream – 100 ml. It is a super-greasy cream with effect in fighting wrinkles and protecting the epidermis against external factors: frost, wind, radiations. It contains natural extract of Rattle, Chamomile, Marigold, Olive oil, A and E Vitamins. This cream is with plant essences.